ATFAQ089 – Q1- Smart Locks Q2- Noise Canceling Headphones Q3- Indestructible iPad Cases Q4- BeMyEyes vs. Aira Q5- Accessing PDF’s using Jaws Q6- Desktop Video Magnifier features Q7- Wildcard Question: Do you buy refurbished or used technology? Panel – Brian Norton, Belva Smith, and Wade Wingler – Q1- Smart Locks Q2- Noise Canceling Headphones Q3- Indestructible iPad Cases Q4- BeMyEyes vs. Aira Q5- Accessing PDF’s using Jaws Q6- Desktop Video Magnifier features Q7- Wildcard Question: Do you buy refurbished or used technology? WADE WINGLER: Welcome to ATFAQ, Assistive Technology Frequently Asked Questions with your host Brian Norton, Director of Assistive Technology at Easter Seals Crossroads. This is a show in which we address your questions about assistive technology, the hardware, software, tools and gadgets that help people with disabilities lead more independent and fulfilling lives. Have a question you’d like answered on our show? Send a tweet with the hashtag #ATFAQ, call our listener line at 317-721-7124, or send us an email at tech@eastersealscrossroads.org. The world of assistive technology has questions, and we have answers. And now here’s your host, Brian Norton. BRIAN NORTON: Hello and welcome to ATFAQ episode 89. My name is Brian Norton and I’m the host of the show. We are so glad that you’ve taken some time today to hang out with us as we jump into some questions. I want to take a moment to go around the room and welcome the folks that are here with me in the studio. First is Belva. BELVA SMITH: Well hello, I’m Belva. WADE WINGLER: She’s got the intro voice going. BRIAN NORTON: That’s beautiful. That’s such a nice voice, we might have you start your own podcast. BRIAN NORTON: Belva is the vision team lead here at Easter Seals Crossroads, a part of our clinical team. We also have Josh. BRIAN NORTON: Hey Josh. How are you doing today? JOSH ANDERSON: Doing great. How are you Brian? BRIAN NORTON: Great. Doing very well. Josh is the manager of our clinical assistive body program and we’re glad that we are here. We also have Wade. Wade? WADE WINGLER: Merry Christmas, Brian. WADE WINGLER: I’m so excited for Christmas this year! BELVA SMITH: I cannot believe that it’s already December. BRIAN NORTON: By the time this show releases on the tenth, it’ll be only a couple weeks away. WADE WINGLER: [SINGS] chestnuts roasting on an open fire. BRIAN NORTON: What a song. But it’s my favorite song. You know what it’s called, don’t you? WADE WINGLER: The Christmas song. BRIAN NORTON: Is it really? WADE WINGLER: Made famous by Nat King Cole. BRIAN NORTON: I’ve been listening to 105.7 here in Indianapolis, which plays just straight Christmas music from Thanksgiving on. WADE WINGLER: It’s one of the light rock stations that kicks over to a Christmas format. That happens in a lot of places. I love it. BRIAN NORTON: We went through a drive-through nativity this weekend which was super fun. WADE WINGLER: We went to a thing called back to Bethlehem where they re-created the entire village of Bethlehem with actors and Roman soldiers dragging tax collectors around, and my kid was getting freaked out and stuff. It was awesome. We petted five camels. BRIAN NORTON: You showed me pictures. I want to go. The one it was really cool. BELVA SMITH: We did that once. The church down the street nearby. It was really cool. It was freezing cold, but we did anyway. BRIAN NORTON: Very cool. Excellent. I just want to welcome new listeners. Just to give you a little bit of information about our show, it’s a question and answer show, so throughout the week we come across various assistive technology questions and solicit your feedback based off the question that we have today. We would love to hear from you and to include your knowledge and information into the show next time. If there are certain things that we talk about today that you have some input on, we would love to be able to hear from you and include that in the show as well. We want to give as much of a well-rounded answer to the questions that we have each week to our listeners. The folks that asked those questions. We welcome your input all the time. If you are looking for ways to contribute to the show, we have a couple of different ways to do that. We have our listener line, 317-721-7124. You can also send us an email at tech@EasterSealsCrossroads.org. You can send us a tweet with hashtag ATFAQ. Again, those are always not only for question but for feedback as well. If you are interested in telling your friends about our show, we are just about everywhere on the Internet. You can find us on iTunes. We have a website set up, ATFAQshow.com. You can go to stitcher, Google play store and other commonplaces that you find podcast and subscribe to those. Look for us, tell others about us. We would love to be introduced to new folks. Without further ado, we’re going to jump in today. We didn’t get any feedback last week, but we do have several really good questions that came in. The first one has to do with smart locks. The first question is, I have a patient that I’m working with that would like a smart lock. She’s currently unable to lock and unlock the door and leaves unlock for her aides. Smart locks. I don’t have experience with smart locks? BELVA SMITH: That makes me really nervous that somebody sitting around with their door unlocked, especially 24/7 in this day and age. I would first like to recommend that whatever lock you choose to get, you should make sure to keep the paperwork on how to change those codes. Because you don’t want an ex-aide to have your code. BRIAN NORTON: Once you give it away, they’ve got it, right? BELVA SMITH: That’s right. We have a lock on our garage entry door to the house. I think I’m going to say it wrong — schlage (phonetic). It costs $80 and has the keypad. We just created a code for ourselves and we created a code for Todd’s mom, so if we are going on vacation or whatever and she needs to get in, she can get in without having our code. I think it stores up to four different codes and they can be changed at any time. This is not what you would call a smart lock in any way. It’s not connected to a lecture or anything like that. It does have batteries in it. We’ve been using it going on two years and have never had to change the batteries. Trust me when I tell you it gets used a lot, because I go in and out through that door many times every day. I don’t know what to say about how long the batteries will last, but I know we’ve been using it for a couple of years and haven’t had to change them. Now there are a lot of different locks that are available on the market today that are compatible with your home assistant, the A-lady or the Google home. WADE WINGLER: A-lady, she plays on the A Team. BRIAN NORTON: That’s the Amazon smart device. BELVA SMITH: Yes. Those range in price, anywhere from $100-$400. The nice thing about those is – I would say the nice thing about those, but what I would say what I recommend if you’re going to go that route is to also consider one of the doorbells so that you can actually see who you are opening the door for. Otherwise you are just having the home assistant open the front door and you may not know who is on the other side. For example, I have the echo show which has the screen so I can say show me the front door, and it will show me who was on the other side because I also have the ring video doorbell. Those have come way down in price this year. They are way cheap now. BRIAN NORTON: Especially around Christmas. BELVA SMITH: Exactly. So if you are going to do a smart lock, I would consider throwing in one of the video doorbells just to be safe. Of course, you can see who is there and they will tell you who is there. Hopefully you can hear that. But you don’t want to be just opening the front door to anyone. You certainly don’t want to be in a position where you are living your front door unlocked. I think depending upon whether you’ve got Wi-Fi, whether you’ve got a home assistant, whether you want to spend $100 or three to $400 is what makes your decision as to whether you’re going with a smart lock or just a keypad lock. I will say, I feel very secure with mine. It’s a very stout lock. It doesn’t feel cheap in any way. BRIAN NORTON: Some of them do, right? BELVA SMITH: Yeah. We just got it at Home Depot. WADE WINGLER: Belva, I have to jump in and say I’ve got the same lock. It’s also a Schlage. It has the ability – I think if I buy another thing to connect it to one of the home assistance. Hours has been in place for almost 2 years and the batteries are still going good. The same thing. I do know there is a pinhole on the back of it that is the speaker whole, so I assume when the battery starts to get low, it’s going to chirp out us or something so I’ll know to go change that. A couple of things of interest. I installed ours, and one of the things you have to know about any sort of it automated lock is when you install it, you’ve got the deadbolt plate and you’ve got the actual deadbolt. The plate is to hold it in the door frame where the deadbolt slides into. We live in Indiana, and the temperature and humidity changes here a lot. If you have one of those doors where you have to lean and it. The year or wiggle it a little bit to get that that to go in, you can’t have that with one of these locks. The deadbolt are actually tapered a little bit so that if the door is out of alignment a little bit, when it closes – because the deadbolt is tapered at an angle, it will slide the door into the right position to lock. But I had to sort of do some wood surgery on my door frame because — until I installed of that, our door, you had to shut it, lean into it a little bit, and then close the deadbolt. That will work because the little battery operated motors that make these things go can’t hold your door shut for you or wiggle it or whatever. When you go to install, I know a lot of people who’ve a lot been frustrated because it’s like, my deadbolt doesn’t line up on the new one or the old one and I got this problem now because I don’t know how to do the carpentry work required to make that happen. I’m no carpenter and it took a would chisel and a few tries, but I finally got it all lined up to where all seasons now, it works and lives up. BELVA SMITH: Mines going to be different from you, because mine is not a deadbolt. Mine is just the standard door handle. The way it locks is after I closed the door – this is what I love about it because we never remembered to lock that door when we went to bed at night. In a minute or 30 seconds – I think in the beginning we chose how long it would wait — it automatically locks. BELVA SMITH: I know, right? WADE WINGLER: In the seventies. Our door in the house where we grew up out in the sticks did not have a lock. We just did not own a lock on our door. You could just come in to our house because – what if the neighbor do something? That was the logic that we used back then. I’m with you. I always like our door too, but I come from a time and place where we didn’t even have locks on our doors back in the day. JOSH ANDERSON: Belva, going back to something you talk about, as far as giving out codes and things like that, or keys and getting — and that person no longer works there. A lot of them you can have different pin codes. As soon as someone leaves, you can just delete that. Some of those can hold up to 100 different ones. A lot of them will send you text messages or they keep a track of who comes in and out. And some of them have what I think is called digital keys, so it’s basically something on your phone, you wave your phone across it. It’ll unlock but in those whose phone that is, when they enter the door and everything else. You can know who is there, when they are there, and all those things, and even get alerts if you’re not home and someone enters that code. BRIAN NORTON: An example of that would be August locks. August the locks have an app on your phone. As you get close to the lock, it’ll unlock your door. WADE WINGLER: That makes me nervous because that if you lose your phone — or someone steals your phone. We debated whether or not to do one of those on our front door. If you lose your phone or someone steals your phone, then they have a key to her front door automatically. WADE WINGLER: What if you lose your key? Your phone you can shut off and do find my iPhone. BRIAN NORTON: You just carry the code in your mind? BELVA SMITH: I push my bun to open my garage door, and I know my code to get into the house. JOSH ANDERSON: What do you do if the power is out? BELVA SMITH: We almost had that. JOSH ANDERSON: Go somewhere else? BELVA SMITH: We almost had that problem not too long ago with the bad weather. We were like, thank goodness the garage door was up. Otherwise — that’s when we took a key and found out – we have one key to our doors in our house. That’s it. BRIAN NORTON: All your locks are different? WADE WINGLER: Hours are the same. BELVA SMITH: We paid to have the condo keyed the same and we have it with this. WADE WINGLER: We also keep a key part at a neighbors house that we trust really well. So if we ran into that situation, you could just go and say, hey, give me the key. BELVA SMITH: Thanks for saying that. That did just remind me. I do have one hidden key. WADE WINGLER: Where is it? JOSH ANDERSON: It’s under the rock next to the door. WADE WINGLER: It’s a plastic rock. BELVA SMITH: It is inside of the garage so you have to get into the garage. BRIAN NORTON: A couple of things to keep in mind that I was taking about, what should you be thinking about when you buy a lock like this. The first one is the style really does matter. If it’s not a regular household deadbolt, or like options are going to be limited because I think a lot of these smart locks include a deadbolt in them. Look for that. If it’s just a regular one that doesn’t have a deadbolt, be mindful of that and look and make sure that you’re getting the right type. BELVA SMITH: Which way does your handle go? BRIAN NORTON: That’s true. Absolutely. Style does matter. You also need to think about full replacement versus a conversion kit. I know you can go out and get a conversion kit for some of these things as well. I would never recommend a conversion kit because I think sometimes you’re trying to make it fit when it really doesn’t fit. I think replacing the whole thing is going to allow you to have a tight fit and be more secure longer-term that some of those conversion kits. For the smart ones, it does matter the kind of connection you want to have. A lot of these use Zigby or Z-wave and they use a smart hub or smart home hub like smart things or wink that will allow you to then connect the lock to the smart hub and then your phone or the kinds of things to go over Wi-Fi and connect with the lock. The other ones I mentioned, August locks, I believe that works via Bluetooth. When you are in range, it connects and can unlock and lock those doors. Keep that in mind. Belva, you mentioned keypads. Some come with keypads, some don’t. If you are interested in a keypad to make sure you grab one like that. BELVA SMITH: That was very important for me because of Todd being visually impaired. We needed tactile buttons. BRIAN NORTON: That’s a very good point. BELVA SMITH: So as we were looking for which when we were going to use, that was one of the things that we had to make sure that we had included. BRIAN NORTON: Lastly, I would make sure to talk about battery life. Figure out what the battery life is going to be. Wade, you mentioned you had your battery for a couple of years now. WADE WINGLER: Almost 2 years. BRIAN NORTON: And they haven’t worn out. I think a couple of them have AA batteries built into them or a place to be able to put AA batteries. Again, check the battery life and what people say about some of those. I know it varies from lock to lock. Schlage has some. I think most lock companies have some version of a smart lock. Some of the ones that I’ve heard of, Lockitron is one, Schlage Sense is their really smart lock line. August is another one. That is more of a direct to your phone over Bluetooth way to open and close doors. There may be some options for this particular individual who wants to make sure she’s more safe and secure in her home instead of having aides coming and going back and forth with her door unlocked. You mentioned being in the country, Wade. My parents still don’t lock their doors? WADE WINGLER: They aren’t in the country. I’ve been to their house. BELVA SMITH: Brian’s parents do lock their doors. WADE WINGLER: And Belva’s code is 4444. BRIAN NORTON: And they are going to be on vacation from such and such a day — yeah. My parents still don’t lock doors. We get frustrated with them when we go down. This is in the time and place to be able to have that where you just unlock your doors. WADE WINGLER: On the other hand, when my in-laws come down, they like all the inside doors, the outside doors, the storm doors, the windows, close all the blinds, pull all the drapes. JOSH ANDERSON: What are they up to? They’ve got something going on. WADE WINGLER: And they keep sending us crime statistics for the suburb we live in. Then I look them up in the town they live in, which is much worse crime. It’s just much worse. BELVA SMITH: I’m kind of the same way. I draw the blinds and everything. My kids are like, awe, mom. But that’s just a habit to draw the blinds and make sure all the doors are locked. But I would just say that, yes, having some sort of a safety lock is probably a good idea. And because we didn’t always remember to lock our door, that’s why this lot became important for us, because now we don’t have to remember to lock the door. It just automatically locks itself. JOSH ANDERSON: When you look at it, some work well with Android, some with iOS, some with different apps, some need Alexa, some work better with different smart devices. It’s always important to think about. BRIAN NORTON: Connections are really important. How do you want to access it? JOSH ANDERSON: And just what do you need it to do? BRIAN NORTON: Our next question is, I have a patient with a history of concussion. She requires noise canceling headphones and currently has the ones from Bose. I believe they are called quiet comfort – I look those up. She cannot wear them and her glasses because they are comfortable for her. She won something that covers her full ear. Any suggestions on a good headphone that might sit on the back of her head or something that doesn’t press into the ears too much and then press on her glasses? It sounds like there is some discomfort when she has the headset pushing against her glasses which then push against her head and it makes you uncomfortable. I don’t know about you guys, but you either cover your ears or you don’t. I don’t know if there are different tensions on actual – I’m looking around the room and we all have these big headsets on. WADE WINGLER: We all look like Princess Leia. JOSH ANDERSON: There are some different ones on the way they lay on the ear. There are some called Libra tones, which I’ve used their in-ear headsets. But the over the ear don’t have – if you think of the big cuffs, the big enough part. They are just a rounded in the middle and sit on the ear itself. Maybe that would work? It would be something you would want to try out. That might be even more uncomfortable. BELVA SMITH: Isn’t that the way the Beats are designed? Don’t the Beats – they aren’t cuff? JOSH ANDERSON: They just sit on top? I think some of them are. Granted, that may be a comfortable with it pushing on the cartilage, but maybe it won’t push on the glasses quite as bad. BRIAN NORTON: We’ve used Libra tone headsets before with folks, and they do actually do the artificial noise cancellation that Bose does it. Where you like a switch. The Libra tone app is enabled and you can adjust that too however much noise canceling you want. That’s a good suggestion. Then that wouldn’t push against her glasses. It would just be on the ear. JOSH ANDERSON: Granted, it might be more comfortable because of the way it pushes against the cartilage of the ear, but you still have the over the — because some folks don’t like in ear headphones. It annoys them, feels like something is playing around in your ear. Maybe that would be a compromise that would go between the two. BELVA SMITH: This would probably be a good one where you would want to go into the store or look for your local assistive technology act to see if they have some different ones that you could try. I know that the caller is saying that they specifically wanted something that would go over the ear, but I’m hearing — I’ve not use them, but I’m hearing amazing things about the aftershocks, which actually sit behind the ear. In fact, I was just with a gentleman a couple of weeks ago that was using them connected to his iPhone. I didn’t even realize that he had a headset on. BELVA SMITH: His was all the way behind his ear. BRIAN NORTON: They go from the back of your head, wrap around to the front of your ear. Then there are little pads that are vibrating and producing sound up on to the bones which would then allow you to hear it really well. BELVA SMITH: I’m hearing really good. BRIAN NORTON: It’s really good sound, yeah. Absolutely. JOSH ANDERSON: Can those do noise canceling? I haven’t really ever used the bone conducting. BRIAN NORTON: Bone conducting headset are mostly for folks who want to still hear what is going on around them. You are not having anything over your ear or in your ear or anything like that, so you are still able to hear what’s happening around you. JOSH ANDERSON: You just have the sound coming through? BELVA SMITH: Then they wouldn’t be at all good for her, because she did want noise canceling. BRIAN NORTON: Talking about Libra tone, which is the noise canceling headset, I put some the call Bose quite control earbuds — anything Bose is going to cost you $200 or more. Libra tone, I want to say they were — before they are between $80 and $200, just depending on features. What’s nice is you can set how much sound comes through, see you can actually get 80 percent of the sound through or set them as high as though go and less than 10 percent of sun will come through the headphones. BRIAN NORTON: They are impressive. I’ve been pretty impressed with those. JOSH ANDERSON: They are pretty neat. BELVA SMITH: The bottom line is none of them are going to be comfortable for long term wear. Any kind of headset is going to become uncomfortable after a certain my time. WADE WINGLER: I think it’s important — this could be a tricky question. If you have a particularly large or particularly small head, then the fit is going to be different. All of the advice out there is you really need to try several on. Most of them have some a disability, so most people think that the adjustment is just for up and down, how tall your head is. But that actually adjusts the tension as well. I think it’s about trying lots of different ones and adjusting them and messing around with it a little bit. The ones that the caller is talking about are supposed to be super comfortable among the ones that are out there, but they just might not be the greatest fit in the world. Like you said Belva, you need to try and put them on your head and check them out. There’s also a ton of online discussion forums for people who are audiophiles about what headsets fit best. If you put “over the ear headset fit” or “comfort” or things like that into Google, you’re going to find a lot of people discussing and saying I tried these and I’ve got a big head and they work great, or I tried these and I’ve got a big head and they were too small or whatever. It may mean that you need to read some reviews on Amazon or wherever and some of those discussion forums. But the best advice is to go and try them on. JOSH ANDERSON: You might be able to do that at Best Buy or a place like that. Still have a lot of them set up where you can break them out and try them on. Maybe not the in ear as much but the over the ear, they probably have some. BRIAN NORTON: That would be a little weird. JOSH ANDERSON: That would be gross. Be careful what you are buying or get there early. BRIAN NORTON: I usually send folks to your assistive technology act. I know even for our library, we have a couple of options, but you’re right, Josh, I think going to a Best Buy or some sort of audiovisual store. We had a Fry’s Electronics here in town. Trying out several different models and styles would be a really beneficial thing for folks to do. We have the Bose headsets, both the earbuds and the over the ear styles. We also have a couple of other versions of those that are less expensive. I think going someplace to try out several of them at once would be really helpful for folks. BELVA SMITH: And if getting out to the store isn’t an option, then just make sure that, as you are purchasing different ones, that they’ve got a good return policy. Most places are going to give you anywhere from 7 to 21 days for a return. That’s going to be the best way to find out, is having them actually on your head with your glasses to see what’s comfortable. BRIAN NORTON: Right. I would love to open it up to the folks who are listening. Maybe you guys have had some experience with noise canceling headsets. You guys may have an option that you use for whatever you do. We would love to hear about those in your experience with those. You can give us a call on our listener line at 317-721-7124. Or send us any at tech@EasterSealsCrossroads.org. We would love to be able to provide that to our listeners as well. Let us know. BRIAN NORTON: Our next question is, any suggestions or recommendations for an indestructible iPad case? This person has a student using it as an AAC device and has destroyed it two times in three months, which is something that I know does happen in K-12 environments quite a bit. Those AAC devices can sometimes get chucked across the room if someone is not happy. I will say, indestructible? I don’t know if there is anything that is truly indestructible. But I know there are more durable cases. I have tended to recommend OtterBox cases for a lot of things I recommend. You can get that in all of the different sizes. It is a matter what iPhone you have. It doesn’t matter if it is an Android tablet. They have cases for all of those. They are very durable. I believe they are waterproof — or at least water resistance. BELVA SMITH: Some of them are water resistant. BRIAN NORTON: Then they come with a shield with the screen. They also have bumpers around the side. It’s a big plastic case. There is actually a plastic cover on a lot of them that will cover up the front of the iPad one is not being used. OtterBox is definitely something that might be useful for folks. I know I use — I’m a religious OtterBox purchaser. I use that for my phone, my iPad, all of the different devices I have. I’m not even that hard on them, but I know I’ve dropped my phone and my iPad several times and it comes up unscathed. OtterBox would be a great option for folks. BELVA SMITH: I think OtterBox is probably one of the ones that I recommend the most for the individuals that are getting iPhones. Life proof is also a very good brand. I got an iPad for my granddaughter last Christmas, and she was barely a year old. I got it from Amazon and it’s called LEFON, L-E-F-O-N, Eva. It’s from Amazon. It was really expensive, but it also included the screen protector. It’s three pieces, the iPad sits in between two pieces and the screen protector fits in as well. She’s been using it for over a year, dropped it many times. I think once a month they take it apart and kind of it and put it all back together. It gets, as they call it, “baby goo” on it. The button will start to get a little sticky. BELVA SMITH: Yeah. It’s been very indestructible for her. I’ve seen it get sat on. I’ve seen it get stepped on. It’s survived it. There is also another one called — I’ve seen this one be used as well. I believe it’s stallion safe shockproof. It’s S-T-A-L-L-I-O-N, again from Amazon. Both of these are under $20. I’m not sure which one you’ve been using, but if you are going through one on an average of every 4 to 5 weeks, at least this might be a cheaper way to go. BRIAN NORTON: I will mention, since it’s being used for AAC — you are using it as a communication device — one of the challenges that might be faced by this particular person is when you put it into a case like OtterBox or life proof for some of these other ones, you are really enclosing it pretty well. Your access to the speaker and other kinds of things are going to be somewhat limited or maybe muffled. I know not totally, but I would be concerned about that a little bit because a lot of these AAC devices, you want to be able to produce speech so that someone can hear what your wants and needs are. If you are covering up the speakers at all, it’s going to be hard for folks to hear and listen. I know some of those cases are pretty airtight cases, so you might see some sort of degrading of the volume of what the iPad or device can produce. BELVA SMITH: Yeah. I think of the OtterBox, the ones I have recommended, have not necessarily had any kind of handle. But the two that I described both do have a foldable handle that can then become the stand. Again, is it going to be durable enough to be used as a communication device? Maybe, maybe not, I don’t know. I know that it wouldn’t be, even with the stand, you can’t give it too much pressure or you’re going to knock it over. Using the stand as a handle works out great, but I would probably want to consider a different style of stand or mount to use it. BRIAN NORTON: Have you heard of this one? It’s called Griffon? It’s the survivor cases. They are extreme cases for iPads. It’s another want to look into. They are probably falling into the category of at least what the OtterBox can do, but maybe more. It can really make sure that things are protected. Big grips is another one. I don’t know if you guys have seen big grips. They are big foam — didn’t really protect iPad per se, itself, but they are big phone groups that go around the outside of the iPad so people can hold onto them more easily. You can toss them and they’ll be okay, but if you’re going to — if it gets tossed into the corner of a shelf or the corner — I’m trying to think of — drawers — desk. Is that what I’m thinking of? BELVA SMITH: I don’t know, Brian. BRIAN NORTON: What do they call those things that have drawers in them and sit in classrooms? BRIAN NORTON: Golly. I got my tongue tied over here. If you could throw it into the corner, it’s not protecting the face of the iPad or the back of the iPad. It may cause some damage. But if it is falling flat on the floor whatever, I think it might survive a drop of some sort. BELVA SMITH: I considered that, big grips, when I was looking for Zoe last year. I consider that one. But I tend to feel like it had near the amount of protection that I really wanted. Again, she’s going to drop it without a doubt. She’s going to drop it. I wanted something that was going to give it full screen front and back protection. BRIAN NORTON: The other ones I’ll throw out there, there are specific AAC types of cases that actually have external speakers. I do believe they provide a level of security and safety with it, so they are not without protection, if you will. Chat wrap has one. I know Toby DynaVox sells one. We just got a couple of those in our library that folks can borrow for 30 days to try them out. BELVA SMITH: How expensive are those Toby’s? I would imagine that they are very good. BRIAN NORTON: I would say they were a couple of hundred dollars. They come with speakers built in. When you’re talking volume, when you’re trying to communicate with other folks with the traditional speakers on iPads. They are good, but they are not great. Sometimes if there is background noise or other things going on in the room, it’s hard to hear. These would at least be able to add some extra volume to your speech and provide a level of protection. It’s more of a traditional AAC handle and case where you can set it up on a desk and carry it around with you. Something to think about. Those were Chat Wraps. It’s from Touch HD, I believe. If you go to TouchChatApp.com, you can find that one. But also look up Toby DynaVox. They have a speech case as well and it comes for the different sizes of iPads. Definitely something to keep in mind. Anybody else have something on that? All right. I want to open it up to our listeners. If you guys have any feedback. Maybe you’ve dealt with this particular thing in your classroom or you have a child who is particularly tough on devices and have you something like this, we would love to be able to hear from you to figure out what you use and how you’ve dealt with that situation in the past. If you’re looking for a way to get a hold of us, that listener line is 317-721-7124. Or you can email us at tech@EasterSealsCrossroads.org. BRIAN NORTON: Our next question is our episode on for the week. What we are going to do is take a look at BeMyEyes and talk about it and how it compares with Aira. BeMyEyes and Aira are both apps for folks who are visually impaired or blind and a lot of folks to be connected to a remote audio descriptor, so they are talking to you and looking through either glasses, a camera from your glasses with Aira would do – or BeMyEyes, which was looking through the camera of your mobile device – to then help describe what’s happening around you or what you are looking at, giving you a better understanding of what to do with whatever is in front of you. We’re going to jump in and start talking about BeMyEyes and Aira. JOSH ANDERSON: If we are talking about a showdown in the kinds of differences, I would say the big difference is cost. BeMyEyes is free. Aira is a paid monthly service. And I would say this is one of those things where you do get what you pay for. Like Mac, what it does is you open up an app. Essentially it is for folks who are sighted or blind or low vision. You let it know which one you are. If I have low vision or am blind, I open up BeMyEyes, telling I need help, and it starts sending out feelers to those sighted folks who are on the app, saying someone needs help. One of them answers and accesses your camera, your microphone, and you can ask them what’s the day on the milk, is it raining outside, anything that you would want. And they would answer that question. With Aira, uses smart glasses and you can get directions. You can call you an Uber, all kinds of different stuff. The big difference is BeMyEyes is volunteers. It’s anyone who wants to sign up. BRIAN NORTON: They are not trained at all. JOSH ANDERSON: They are trained at all. I guess you are accepting that you are not going to be weird or anything like that, but I’m sure that people read it about as much as they read the one when they update their iTunes. Whereas folks on Aira are all going to be trained, vetted, background checked, all those things. So you are along them a little bit more access and you know what you are getting a little bit more. I’ve had folks use BeMyEyes and find actually helpful. The thing is if they need help at 3 o’clock in the morning, it might be a while before someone actually answers because no one might be on their phone and hitting those apps at the time. Also Aira is more encompassing. It’s going to be able to walk you seven miles to the next bus stop or something like that and tell you everything that is around you. If someone answer your call on BeMyEyes and you take them on an eight hour walk, they are probably going to be upset that they answer that call. BELVA SMITH: I don’t think that it was intended to be used in the longevity like that. It was intended for, like you said, quick question and not necessarily to give you directions or give you as much does what do they call it? Information about your surroundings? BELVA SMITH: Something they call it. JOSH ANDERSON: I like information about your surroundings. That sounds good to me. BRIAN NORTON: It’s a very good term. JOSH ANDERSON: That works. The whole process behind it was borrowing someone’s eyes, so for something quick, something that I need a little bit of information on. As simple as which one of these is the green tie? Something like that. And other things. It’s very different. They are very different in the scope of what they can do, although they are based on the same idea, of sighted assistance. BRIAN NORTON: Yeah. I think a couple of other things, BeMyEyes, to picture it for folks who haven’t use the app, I think the FaceTime where you are just having a conversation through videophone where they are seeing what you are seeing to the camera on your smart phone. That’s kind of what that is. When you are talking with Aira, they have a dashboard that is connected to those glasses that you are wearing. You are on essentially a video phone call where they are saying what your glasses are looking at, and then they have a dashboard with all this other information. They can sense of where you are tricky if you’re looking for directions, they can send you places and tell you how to get there. Lots of things. If you need to call an Uber, they can tell Uber way to pick you up, those kinds of things. Lots of information. WADE WINGLER: I think the even keep track of your preferences, right? Like the kinds of restaurants you go to. Things you provide and it’s okay. But they like to know, you like Chick-fil-A. Let’s find one of those. BELVA SMITH: I think a good distinguishing explanation that I’ve heard about the two – because you have to keep in mind, one of them is classified as a wearable device, which is what the Aira is. Aira is a service that is going to help the blind individual. It’s basically like a visual interpreter for the blind individual. It’s going to give them the ability to navigate, whereas BeMyEyes isn’t necessarily there to provide the navigational as much as the informational. BRIAN NORTON: Right. That’s true. BELVA SMITH: And there is the cost comparison. One of them is free, one of them is not. BRIAN NORTON: I think another thing I’ll throw out there is, really, BeMyEyes is for that brief interaction. There is no contingencies with that. If you are in an emergency situation, those kinds of things, I think with Aira, you can have them call emergency or do things for you. They have a partnership with Uber so they can get to the transportation if you need transportation. There is a whole lot more that goes into it with Aira. And that’s what you are paying for. You are paying for that wraparound service than just in and out with specific questions and needing specific information about a particular something that’s in front of you. BELVA SMITH: I think if you are a really independent, active blind individual who may be going to school or going to work, you want both. BELVA SMITH: If you can afford to have both, you want to have both. They both have some similarities, but they are different enough that – I always think of the toolbox with the screwdrivers and the wrenches. You need different sizes to do different jobs. JOSH ANDERSON: Depending on what you are doing, Aira, while expensive for the time, some businesses are starting to pick that up. There are some universities. I think Ball State University in Indiana has their own license, so if you are a blind student going there and you have Aira, as long as you are on their Wi-Fi on their campus, you are using their minutes. You are not using yours. BRIAN NORTON: I didn’t know that. JOSH ANDERSON: There are some grocery stores that are starting to do it. Some airports are starting to make it available. You have to have your own device, so you have to have Aira. You can’t just walk in and pick one up and go. As long as you are on their system, you are using their minutes and not using your own. So if you only have so many, it can cut that price down because if that’s where you shop and you are in the airport a lot and you’re going to school, you probably don’t need as many minutes because most of the time you’re using someone else’s. BRIAN NORTON: They have an intro package which is 30 minutes a month. It’s basically like a data plan. It’s $29 per month for their intro, which is for 30 minutes a month. There standard license or feet would be $99 per month. That gives you about 120 minutes of service. And if you get the advanced, which is 199 per month — if you can afford that – that’s 300 minutes. They also have this thing called guest free. I’m not exactly sure what that is. That’s new to me. It’s free to download, free to use, and it talks about having access to the smartphone app that comes with it. And then Aira access calls, I’m not sure exactly what that is, which I guess it allows you to connect to an agent for free when you use one of our Aira access offers. I’m not sure what that is. Maybe that’s when you have a promotion or something going on. JOSH ANDERSON: Or that could be with those businesses that offer the service know. BRIAN NORTON: Or just take a taste. BELVA SMITH: Or take a test. BRIAN NORTON: I guess if you are wanting a Diet Coke and you got a sip of energy drink, that could be shocking. JOSH ANDERSON: Especially in the evening. WADE WINGLER: Then you’ve ruined it. Then you just throw it away. Come on. JOSH ANDERSON: What would the kids drink? WADE WINGLER: Or if you are like me and you have diabetes I can’t tell regular Coke from a Diet Coke very well. BRIAN NORTON: If you are interested in learning more about Aira, their website is Aira.io. You can find information about Aira there. BeMyEyes, you can go to the iTunes Store and look that up on iTunes. It’s BeMyEyes, all one word, B-E-M-Y-E-Y-E-S.
BELVA SMITH: It’s also available on Android now. BRIAN NORTON: It is. You’re right. It will give you information about what it is, how it works. BELVA SMITH: Be prepared because you do have to sign up for an account to use BeMyEyes. They have to send you an email to confirm it. It’s not like you’re going to download it and using it. It does take a minute to get it set up. JOSH ANDERSON: It’s not a bad safety check just to make sure you don’t have bots and things like that running accounts. BRIAN NORTON: I was going to say for the Joker out there who once to screw around with people, if they have to fill out an application and wait, they are not going to hang around most of the time. JOSH ANDERSON: I never had to do it, never had anyone have to do it, and never had someone have problems. But if you do have to ask for help and someone gives you – had you drink the olive oil as opposed to the Diet Coke, I think you can file complaints and things like that. I was just thinking. And energy drink and a Diet Coke, not that big of a difference. But olive oil? BELVA SMITH: I think it’s important to point out that the equipment that is required for the Aira glasses is also free. They provide you with equipment. JOSH ANDERSON: And as they update and upgrade, I think they send you the new one. They were using Google Glass for a while. Now I think they are using something else. That would just continue to change and get better. BRIAN NORTON: Our next question is, I have an employee using JAWS — which is a screen reader for those who don’t know — to access an electronic medical record system. For the most part, the EMR system is accessible but there are some screens and PDF prints that do not read for the employee. Is there any way for the employee to access this information? I’ll just throw out there that in a lot of job situations, screen readers in general are going to work pretty well because I think a lot of things have moved to more accessible formats, so there using more of a Windows-based system. A lot of it is a hybrid system. It all depends on what the programmers did to make it accessible, making sure that there are all tabs and other kinds of information for the screen reader to grab onto and be able to read as it taps through forms and things like that. One of the things I’ll mention is we provide a lot of scripting around here. If you do run into a situation where you are using a screen reader on a third-party application, maybe like this EMR system, scripting can really improve access. You can make moving around the screen more efficient by pressing one keystroke as opposed to 10 keystrokes to get to a particular area of the screen. Scripting is certainly a possibility to make access better. I don’t know if scripting is going to do a lot with PDF documents that may be coming from the EMR system that they are talking about. But certainly just general access to the EMR is going to get better as scripting can be provided. JOSH ANDERSON: Has been three years? WADE WINGLER: I think version 7 or something. BELVA SMITH: It’s been quite a while. My short answer to everyone who says, oh, I have PDF, I can’t access — you should be able to access a PDF as long as it’s text. WADE WINGLER: I’m guessing this isn’t because they are talking about PDF prints. My guess is within the EMR system, these are probably scanned documents. These are probably things that were printed out, scanned in, and they’ve dumped them in there. Then you’re going to have to look at OCR to make that happen. BELVA SMITH: Or read aloud should be able to do it, which is built into the Adobe Acrobat program itself. JOSH ANDERSON: Another thing is if you are in the EMR system, it might not be using Acrobat. BELVA SMITH: You are correct. BRIAN NORTON: Does Acrobat we just standard PDF files? JOSH ANDERSON: A lot of them. WADE WINGLER: If it’s real text. But I’m guessing this isn’t real text. It’s an image. BRIAN NORTON: It’s just a picture. WADE WINGLER: I’m guessing it’s an image. BRIAN NORTON: It’s like a 3-key keystroke. BELVA SMITH: Insert, space bar, “O” and you hear a funny sound. Then you do a “W” for the window or “D” for the document. And it will run through and pull any text that you can from that screenshot. And then it will begin to read it to you using the JAWS voices, so you’ll know that it has pulled that text. BRIAN NORTON: You should’ve seen Belva work through that keystroke. WADE WINGLER: Her fingers were going. JOSH ANDERSON: She was playing a magical invisible keyboard. WADE WINGLER: I’m googling it, and she guide right. BELVA SMITH: I have to dig. There are a lot of keystrokes. WADE WINGLER: Our next show needs to be Belva’s brain where we just ask her things that she tries to recover. BELVA SMITH: A lot of keystrokes in that head. JOSH ANDERSON: Another thing you can do, especially for those PDF prints is see if you can use seeing AI. I’ve used it to read a computer screen to myself before. OrCam is another, but that’s another pretty expensive way. BRIAN NORTON: That’s a good idea. I didn’t think about. JOSH ANDERSON: Or if you use something else for OCR — and Wade is going to yell at me because this is probably a pretty bad HIPAA idea — but print it out and have it read to you by some sort of OCR device and then shred it. BELVA SMITH: What about sending it to the virtual — what’s it called? Freedom printer. You know what I mean? So instead of printing it out, you print it to the virtual freedom printer and then it will read it to you as well, hopefully. WADE WINGLER: More options than there used to be, that’s for sure. JOSH ANDERSON: For sure. The thing is you may need scripting because it does say some screens. If it is one where you have to fill out boxes are things like that, you might need some scripting just to know where you are all the time in order to fill in boxes and other things like that. BELVA SMITH: What scares me about that is she saying some screens it doesn’t speak at all. In order for scripting to work, Josh, you and I have had this conversation, the screen reader has to be able to pull something from the screen. BRIAN NORTON: The number one thing I do just make sure that there is text – and what people can do is turn your jaws cursor on and just move your jaws cursor around the screen. If your JAWS cursor can find it, it’s there. If it says “blank, blank, blank,” it’s not really there. BELVA SMITH: And if it jumps from the top of the screen to the bottom of the screen, then there is really nothing there. No scripting is going to fix that. BRIAN NORTON: Josh, I didn’t think of that, but seeing AI and some of these other apps, you might be able to put your Aira glasses on and go to town. That might be enough. But I think EMR systems, you’re talking about protected health information and you can’t really have that relationship. BELVA SMITH: But seeing AI doesn’t say the information. It captures it, reads it, and it’s gone unless you tell it to save. WADE WINGLER: I’m freaking out over here. BRIAN NORTON: Wade is our security officer. He just blew up. WADE WINGLER: Yeah. That would be a HIPAA thing. Just my opinion. I’m not a lawyer. BELVA SMITH: I wonder if the Aira glasses would also be a HIPAA thing because you’re dealing with someone on the other and that you don’t really know. WADE WINGLER: You would need a business associates agreement in place with them. I don’t know if they do that or not. BRIAN NORTON: That would be interesting to find out. That would solve a lot of problems who have special Situations. BELVA SMITH: So the short answer to this question is try your convenient OCR if you haven’t already tried that. BRIAN NORTON: Which is what keystroke? BELVA SMITH: Hopefully that’s going to get to access to those PDFs. As far as the screens, I don’t know. JOSH ANDERSON: And if not, talk to your privacy officer. BELVA SMITH: Another good question for this person would be what version of JAWS are you using? JAWS 2019 has developed so much more than some of the older ones. A lot of businesses are still using – like I’ve currently seen JAWS 13 being used by a business. That’s so outdated compared to where they are today with the 2019. That would be a good question, is what version of JAWS are using, and could you upgrade? JOSH ANDERSON: That might actually fix the problem in itself. BELVA SMITH: That might fix the problem. WADE WINGLER: It’s interesting, I’m looking at Aira’s website, and they do have some stuff about – I’m sorry but this is Aria. Different company. I’m googling the wrong thing. I’m not saying anything about Aira and HIPAA which means they probably can’t do a business associate’s agreement. BELVA SMITH: I don’t think they want people – and this is something that I have to explain frequently to my consumers. I don’t really think they want you to put those glasses on and think that you’re going to be able to do your job all day long. They don’t want you keeping someone on the phone for eight hours a day. BELVA SMITH: I don’t think so. Think about how quick your 300 minutes are going to go, right? BRIAN NORTON: Our next question is, my Aladdin CCTV – that’s an old CCTV. That’s when I first started. BELVA SMITH: I pictured it right away. Todd had one for many years. BRIAN NORTON: It reminds me of the Nokia brick phones. It’s like the tried and true. WADE WINGLER: Did you rub my lamp? Wrong Aladdin, sorry. BRIAN NORTON: It says my Aladdin CCTV – or video magnifier for folks who aren’t familiar with the word CCTV don’t stop working a few weeks ago. What should I be considering when choosing my next video magnifier? BELVA SMITH: You definitely want to go into your local assistive technology place and sit down with some of them and look at all the different options you got. CCTV’s have come so far since that Aladdin. You have to ask yourself what it is you need. The first question is, can you still see it good enough with magnification? Or would it be helpful if it could only be magnified but possibly be read to you? Yes, that’s right, CCTV’s can do that now. BELVA SMITH: And you needed to be portable? Because the Aladdin is pretty small screen size. BRIAN NORTON: It really is. BELVA SMITH: So do you need something that is going to be portable and go from room to room or office to school to home? Or do you have a permanent location that you want to put it in. And then what kind of features do you need? Do you need the line tracking? There is just so many changes with CCTV’s. JOSH ANDERSON: There are so many different ones. BELVA SMITH: Yes. And you can’t just — you’ll be doing yourself a disservice if you listen to someone say to you, oh, here’s what you need. You need the “XYZ” that does “ABC” because until you’ve seen it and seen all the other options can’t you just don’t know what’s going to be the best choice for yourself. It’s a lot of money. Even though CCTV’s have gotten all these great new features, and the prices have come down somewhat, they are still very expensive. BRIAN NORTON: And then up from there with some bells and whistles. BELVA SMITH: Where are the buttons located, that’s also a very important thing. I definitely highly suggest that you go sit down in front of some different screen sizes and just shapes and sizes of them to see the need and “XY” table or is that not really important to you, lots of different questions to be asked once you see the different — that would be a good question to know, how many CCTV’s are on the market today? BRIAN NORTON: That may show up in our next show. BELVA SMITH: There are lots. JOSH ANDERSON: A lot of the handheld CCTV’s have HDMI-out now so you can hook them to your big-screen TV or something like that and have a portable one and one for home, just depending on what you need before. It’s really, what you need and what features work best for you? BELVA SMITH: Right. In my guess is you are probably using the Aladdin with a black background and white font. You could probably replace that with an iPad and a scan jig for under $500 and have a screen almost the same size, if not bigger, and truer black, truer white. That may be all you need. BRIAN NORTON: Belva, you mentioned go to your local AT place. I want to make sure folks who were in this situation where your technology has gone out, or for whatever reason you are considering a new type of technology, specifically assistive in nature, check out your local assistive technology act. I’m going to drive you guys to our website, go to EasterSealsTech.com/states. That will take you to our site where you can plug in your state and it will bring up your local or state assistive technology act. They would then be able to look you up, if you are not in the same city that they are in, they’ll tell you where – typically they’ll come to your door to do a demo, but they may also send you to a regional site as well to be able to take a look at some of the technology. But again, it gets you in front of stuff to touch it and feel it, experience it a little bit and make an informed decision on what you want and what’s going to best meet your needs based on some features that you may not know even exist or we didn’t get to mention on the show. BELVA SMITH: I’m going to guess that in our lending library we have 20 plus desktop CCTV’s. Those are all different ones. Not because we have three of this one and four of that one. That’s just the different ones. What we have is a drop in the bucket to what’s available. BRIAN NORTON: We will get one that has all the features. But you can get any variation of that as well. The other thing I’ll mention with care, because of a mentioned this before, vendors, a lot of time, will offer demos of their product. If you are interested in a particular one, you can have a vendor come out. Often they’ll be happy to come out and show you something. But be careful, because they are there to sell you a product. Just be careful with that. But again, if you are interested in a particular one, they will oftentimes come to your door and show you the product because they want to sell you it. That’s under the option and they were to get your hands on some of the technology. But again, know that they are at the door to sell you the product and make sure that it’s really something that’s going to meet your needs and not anything extra. It’s kind of what you are really looking for with that. BELVA SMITH: A lot of times, the libraries, independent living centers in your area, they will have maybe one or two different CCTV’s set up that you can take a look at. That might be another option. But really, I would say you want to look at no less than four five different shapes and sizes before we figure out which one is going to be appropriate for you, especially if the money is coming out of your pocket. [58:54] Wildcard Question: Do you buy refurbished or used technology? WADE WINGLER: And now it’s time for the wildcard question. BRIAN NORTON: So our next question is the wildcard question. This is where Wade has spent time, studying, tedious work to look around for questions that maybe we would have a hard time and be challenged to answer. WADE WINGLER: Hours of time searching for these. BRIAN NORTON: What have you got for us today? WADE WINGLER: It’s just before Christmas as we are recording this. I have started my Christmas shopping. My kids want a gaming console, right? The one that they’re interested in – they are six and seven – is the Nintendo switch. I’ve been shopping around and looking for those and doing the black Friday sales and all that kind of stuff. I won’t say whether or not they are going to get one for Christmas, just in case they happen to listen to the show or their friends do. BRIAN NORTON: They downloaded to their devices. JOSH ANDERSON: Only this time of year. BRIAN NORTON: If they don’t, you should have a conversation with them about the shows. WADE WINGLER: Yeah, right. As I was shopping, I noticed that I could save about $30 on a $300 gaming console if I bought a used one or a refurbished one. Even on a game that was a $60 game, I could save five bucks if I bought a used game. The game is nothing but software on a microSD card anyway. My question for you guys: do you buy refer refurb or used when it comes to videogames or computers or phones? And the follow-up question is, if you do or don’t do used, do you buy extended warranties? JOSH ANDERSON: I’ll go first just because I never go first. They’ll be nice. BRIAN NORTON: Okay, Josh is going first. JOSH ANDERSON: On video games, yeah, used, find, not a big deal. With systems, I haven’t because I’ve heard the horror stories of its already registered to somebody. Four weeks later and 25 emails, it’s mine. By that time, it was worth the extra $50 to go ahead and get one. Extended warranties, it depends on how much the warranty is as opposed to what the warranty is with the device itself. A lot of times, big-ticket items, you’ve got pretty much a year warranty anyway. So if the two-year warranty is $100 for a $300 thing, it’s really not worth it. WADE WINGLER: It’s usually about 10 percent of the cost is what I found. JOSH ANDERSON: It’s usually about 10 percent. We got a new TV as a gift, and we did buy the extended warranty. But I think it was $50 for four years. It was well worth it. That will replace it and cover lot of the things that the warranty my neck cover in the long term. With computers, systems, things like that, I have a hard time buying used or refurbished just because I’ve heard the bad news on some of those things. BELVA SMITH: I personally would never buy a used computer, nor what I recommend to a friend or family member to buy a used computer, because the price of computers has come down so much. Honestly, when you buy used computer, you don’t know what you are buying. You don’t know anything about the hardware, you don’t know anything about the software. Chances are anything that came preinstalled on it is already registered to someone else. Is not going to work for you anyway. Game decks I have bought used. That’s an iffy question. I trust game stop to sell me something that is going to be good and usable and are making a good deal. I don’t know. I could be wrong about that. As far as games go, Oliver once the switch too. I straight up told him no because I don’t think he’s responsible enough yet. We started with the DS, and I told him if you can take care of the DS between now and next Christmas, come back and talk to me about the switch then. JOSH ANDERSON: That’s a good idea. BELVA SMITH: I did buy two new games and several used games. Forty dollar game? $2.99. JOSH ANDERSON: A lot of times, those used games, you can get buy two, get one free, or things like that. BELVA SMITH: I just decided that that was a reasonable risk. With the games, I’m like you, Josh. The old CD type games, if they were scratched, you could tell. But these are those SD cards. You can tell if there is any damage to it until you plug it in and find out. Again, I’m trusting games up to not be selling me something that doesn’t work. JOSH ANDERSON: If it doesn’t, they’ll usually take it right back, no questions asked. They are actually pretty good about that. BELVA SMITH: I literally have paid $2.99 for a couple and thought, if it doesn’t work, I can eat the three dollars. Yeah, that’s where I am with the used. Warranties? I don’t know. I used to work at a big computer store. I know those extended warranties are there to make the company money. I think the last extended warranty or extra warranty I bought was for my Apple watch, and I did it because I was just sure that I would crack it and I never did. So when I got my new one, I didn’t buy [the extended warranty]. BRIAN NORTON: For me, first off, I don’t usually ever buy anything that is used. I don’t do gaming or anything like that, so I don’t know what that world looks like with the used games or whatever. I never produce anything that’s been refurbished. No particular reason, just I want new, fresh, clean. I want the cellophane on the packaging to be able to pull it off and just know that it’s right off the presses. I know I’m not going to run into any issues. Maybe I wouldn’t. I just never think about buying something that’s refurbished in that particular way. Also, I think with extended warranties, usually it depends on the device, depends on what I’m producing. I think of things that typically break. We have a carpet cleaner at home. I bought a war to for that for three years and brought it back twice. But there are other things. I was just at the store today buying some thumb drives. They want to sell me an extended warranty for three years for five dollars per thumb drive that they can go in and save my data. I’m like, no, I’m okay. JOSH ANDERSON: How much were the thumb drives themselves? BRIAN NORTON: It’s a $9.99 thumb drive. BELVA SMITH: I promise you they are not s saving your data. BRIAN NORTON: I was like, can you explain how that works? Anyway, I hardly ever it depends on the expense of what I’m purchasing and the type of device I’m producing. Usually for electronics, if it’s my TV, I’m probably going to get an extended warranty. I don’t want something to happen to that. JOSH ANDERSON: Wade, with game systems got with the switch, I think you are safer than with an Xbox or PlayStation because you can take Xbox and PlayStation apart. You can add a bigger hard drive, at different things. Essentially they are computers made for gaming, whereas the switch is different. People are probably not going to be opening that thing up. WADE WINGLER: I ironically ended up buying two videogame systems because they’re little and we had a Wii and have them playing the old games forever. So this summer, we found a bunch of garage sales that had used Wii systems. So for like $100, we bought a box that had four Wii gaming systems, twelve controllers, and 50 games because some lady was unloading her kid’s Wii system forever. I thought I don’t have to buy anything else for Christmas. We just have to wrap all that stuff up separately and they’re going to get — I got four gaming systems and twelve controllers. Clearly I’m going to have enough working stuff that I don’t have to worry about buying a used. As we get closer to the holidays, it’s like, Nintendo switch. BELVA SMITH: That thing is $400, right? WADE WINGLER: $300. Although you can get it with bells and whistles and games and stands and stuff and get the price up. BELVA SMITH: The DS was $199. BRIAN NORTON: Here’s the favor I have for our listeners. As far as the INDATA Project, we have just purchased an Xbox. We got some of the accessible controllers that Microsoft has for their Xbox gaming console. I need to purchase some games for it and I had no clue. I’m not a gamer, I don’t understand games. BELVA SMITH: You want to buy a racing game. BRIAN NORTON: Racing game, a sport like golf. I don’t know. I was wondering if people have had some experience with the different games and things that would make it — things that would be engaging for folks to be able to do a demo with to show them what they can do and how maybe the accessible controller works, not necessarily the handheld one that folks typically use. I would love to hear from you on that. The way to get that information to me, you can send a voicemail through our phone line, our listener line that is 317-721-7124. Or you can send us an email at tech@EasterSealsCrossroads.org. We would love to hear from you on that. BELVA SMITH: Take the opportunity to help Brian spend some of his money. I’m usually the one that’s helping him spend the money. Now you get the opportunity. BRIAN NORTON: Because now I can demo games, which would probably then make me more interested in gamers. As for the rest of it, please let us know if you have questions or if you have feedback with anything that we talked about. I gave you that listener line, 317-721-7124. Send us a tweet with hashtag ATFAQ. Or email us at tech@EasterSealsCrossroads.org. We certainly want your questions. In fact, without your questions, we really don’t have a show. Be a part of it. WADE WINGLER: Information provided on Assistive Technology FAQ does not constitute a product endorsement. Our comments are not intended as recommendations, nor is our show evaluative in nature. 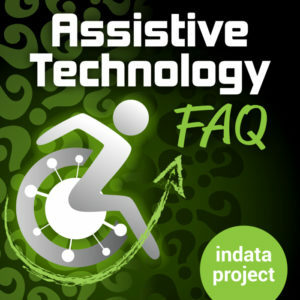 Assistive Technology FAQ is hosted by Brian Norton; gets editorial support from Josh Anderson and Belva Smith; is produced by me, Wade Wingler; and receives support from Easter Seals Crossroads and the INDATA Project. ATFAQ is a proud member of the Accessibility Channel. Find more of our shows at www.accessibilitychannel.com.